Architect and builder. Shoe designer and cobbler. Bonnie and Clyde. Salesmen and their support staff. The Designer and the Seamstress. In any industry, there is always the creative mind and the skilled hands that produces the final product. Most people would see me as the person who knits and stitches every dress together, with most of my time spent having a needle in hand and a spool of thread in the other. The image of a seamstress, busily unravelling out dresses like a production line would be the first one that comes to mind. Yes, something like this, but with more needles and thread. When I first started in the business, I had to juggle between the hats of designer, seamstress, customer relations and public relations all at the same time. Admittedly, I’ve done my fair of sewing and stitching over the years. Something that I still enjoy. Over time, I’ve been blessed with more brides-to-be who entrust me with their big day which means I’ve had to focus more on the designing and engage seamstresses. But what then, is the difference between the seamstress and the designer? 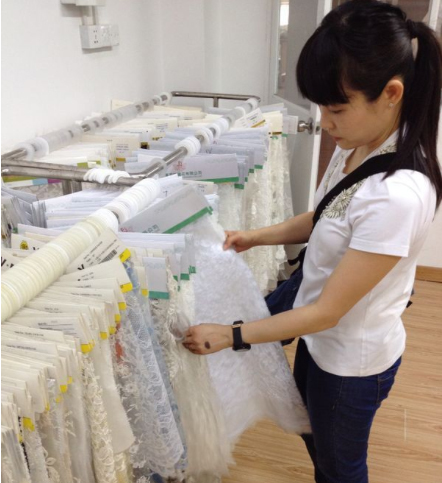 Fabric selection – an integral part of the designer’s duties. Imagine, an architect and a builder. In the setting up of a structure, be it a multi-storied megaoffice, or a small cottage, one needs to have both the architect and the builder (I’ve left out the engineer for simplicity – my apologies, engineers). Before work begins, the architect would sit down, take a deep breath, and put pen to paper. His/her hand will move over the parchment, the scritchy sounds of the graphite emanating from the tip of the paper. Slowly, ever so slowly, the image of the building begins to form. As the architect draws the shape, he is already beginning to think of what material will go into making the building. The exterior, perhaps, would be white paint over sandstone, while the pillars would be reinforced steel. Glowbulbs and lights will decorate the laticework, and glass panel windows would sheath the outer layer of the structure. Here I am, hiding underneath a cap while I build up the basics of a dress. The builder now takes his place on the stage. Holding the design that the architect has produced in his hands, the builder will carry over the bricks, and stage piecing them together. Brick by brick, layer by layer, the builder forms the structure and eventually, the building stands tall and proud. Two very different yet very important roles. I play the part of designer more these days and ensure the quality of work produced by the seamstress is of quality. As a designer, my work is that of the architect. Like a building, the design of a dress begins first. 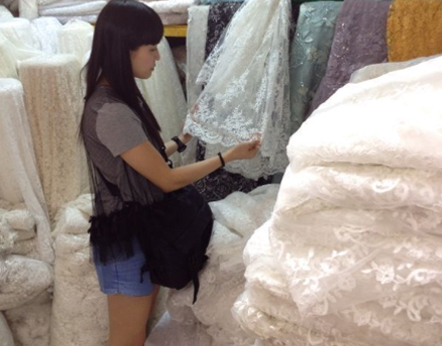 The cloth, lace, beads, crystals or sequins are all carefully selected to converge into an entire work of art. After the design is done, I work very closely with the seamstress, like the builder, the skilled hands begin working by pulling the thread through the needle. It takes a lot of effort! 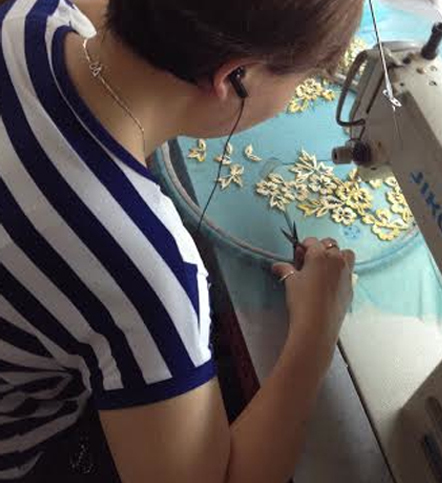 I feel blessed that over the years, I’ve worked with wonderful artisans who share the same expectation for quality. They are often overlooked and shy away from the glitz and glamour of the industry. I feel that they are often undervalued as there are now less people who have the skillsets developed over many years of hard work. Thank you to all of you, the unsung heroes of fashion.